Former UNSR on the rights to freedom of peaceful assembly and of association, Maina Kiai’s, final report demonstrates the positive impact civil society has made in communities around the world. Authoritarian governments around the world increasingly promote negative narratives of civil society by accusing it of being elitist, corrupt, or foreign agents; of supporting terrorism; or simply being ineffective. These narratives are intended to undercut support for civil society organizations (CSOs) and activists among the general public. 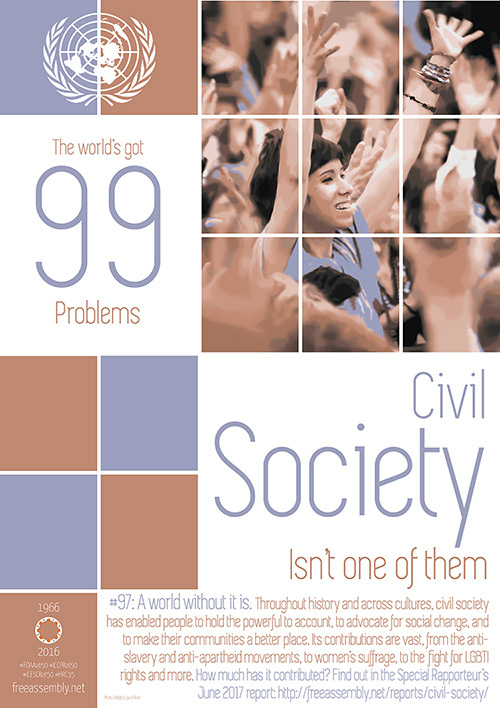 Negative perceptions of civil society among the public diminish its influence in civic and political processes; affect its ability to hold governments, businesses, and itself accountable; and, in some cases, leave CSOs and activists at risk of violence. To counter this narrative, the Civic Space Initiative assisted the former United Nations Special Rapporteur (UNSR) on the rights to freedom of peaceful assembly and of association (UNSR), Maina Kiai, in producing a report entitled “Imagining A World Without Participation: Mapping The Achievements Of Civil Society.” The report, which was submitted to the United Nations Human Rights Council (UNHRC) in May 2017, demonstrates the positive impact civil society has made in communities around the world, the documentation of which offers civil society activists moral support and encouragement and allows them to counter authoritarian narratives that seek to demonize the sector.